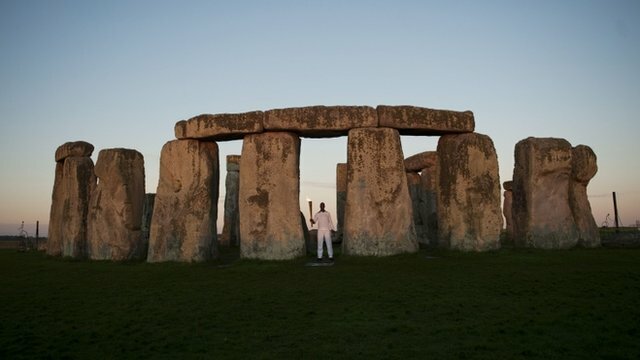 ATHLETICS hero Michael Johnson carried the Olympic Torch around Stonehenge during a special event at sunrise today. The 400-metre world record holder and Olympic gold medallist paraded the flame at the World Heritage Site at dawn as he ran the first leg of day 55 of the relay around Britain. Speaking afterwards, Johnson gushed: “It was amazing. It was a great experience to carry the torch around the iconic Stonehenge. “I don’t rank. It’s all great. This is great; winning an Olympic gold medal is great. Johnson, 44, who won four Olympic gold medals and holds the world and Olympic records in the 400 metres and 400-metre relay, predicted that Britain will do a great job of hosting the Games. He said: “It should be a great Games. The Olympics is always phenomenal. At Stonehenge, near Salisbury, Wilts, Johnson posed with university student Amelia Clifford, who ran with the torch yesterday. Amelia, known as Millie, is a promising young 400 metres and 400-metre hurdles athlete. The 19-year-old, from Salisbury, who is studying politics at Birmingham University, said it was a dream come true to meet her hero. After Johnson ran today’s first leg he handed the torch to sixth form student William Copp, 17, who uses a wheelchair because of cerebral palsy. Today’s proceedings at Stonehenge followed an event at the site on Tuesday when fires lit up the ancient stones as part of the London 2012 Festival.